When the red and blue sides of London clash, there are always fireworks. In the league, points were shared in both meetings (0-0 and 2-2 draws) but Arsenal got the last laugh in the Carabao Cup, knocking Chelsea out with a 3-1 aggregate win over the two legs. With 1xbet as a sportsbook you can get a bonus code and place bets on Arsenal to win a trophy this season, with odds currently at 33/1 for the gunners to win the FA Cup and Europa League. However, this season it’s a completely different story. Both Chelsea and Arsenal have leapt into a new chapter with managers Sarri and Emery, respectively. For Arsenal, the jump away from Wengers reign was a significant one, with the club and Frenchmen together for 22 years. It’s a slightly different story for Chelsea, who change managers as often as you’d get a haircut. Both Sarri and Emery have inherited good squads possessing real talent: Arsenal have Aubameyang, Ozil and Lacazette, Chelsea have Hazard, Kante and Willian. The pair have also invested wisely this summer, bringing in plenty of new faces. Emery has made five additions to his squad, with Lichtsteiner and Sokratis bought to solidify a shaky back line. Guendouzi and Torreira also sure up the defence, with the CDM’s capable of covering a lot of ground. A goalkeeper, Leno, has also arrived although is yet to feature with Cech between the sticks in their first game. Emery’s focus has, rightly so, been on Arsenal’s defence, with their attack the only thing that worked at times last season. Chelsea had a lively end to the transfer window, and I’m sure most of their fans were counting down the minutes until the window shut, stopping Hazard from departing. First choice keeper Courtois went AWOL from pre season training (before signing for Real Madrid) and the blues were quick to break the world record fee for a goalkeeper, paying £71m for Kepa. Kovacic also arrived on a season long loan and Sarri bought over Jorginho from his former club, Napoli. They now possess a solid midfield with new boys Jorginho and Kovacic set to link up with the non stop runner - Kante. The battle between the two clubs on Saturday evening will be decided by the midfield. If Arsenal can dictate play then they will be able to up the pressure on Chelsea’s defence, that can easily succumb to Aubameyang’s eye for goal. However, if Chelsea get up and running with Jorginho given enough time and space on the ball then a few key passes could slip through the cracks - and Hazard only needs one chance to finish. A common occurrence for gunners fans is Hazard causing plenty of issues, and I think he will do it again on Saturday. However, I can’t see Emery not taking at least 1 point away from Stamford Bridge in what is sure to be an exciting affair. Pierre-Emerick Aubameyang's next league goal will be his 150th in the top five European leagues. 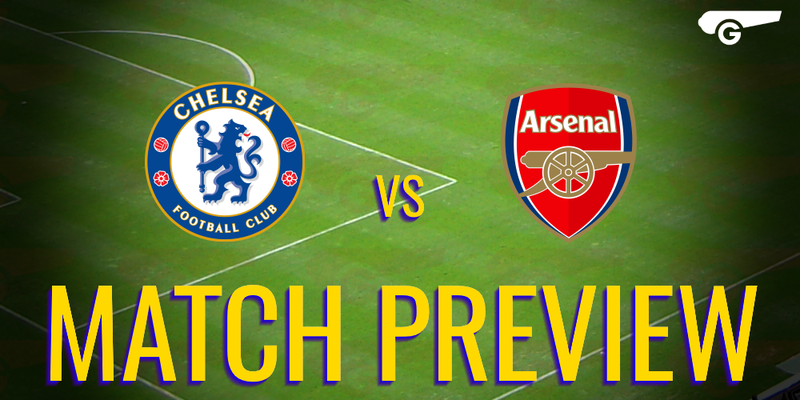 Chelsea have won five of their last six home league games against Arsenal, with the exception last season's goalless draw. Jorginho could become the fourth player to score in his first two Premier League appearances for Chelsea, following in the footsteps of Adrian Mutu, Deco and Diego Costa. The Gunners have kept clean sheets in their last two league and cup games at Stamford Bridge. They have not recorded three successive shut-outs there since 1924. Blues boss Maurizio Sarri lost just four of his 57 home league games in charge of Napoli (W43, D10). The last Arsenal boss to lose his first two matches in charge was Steve Burtenshaw, who suffered defeat in his first three games as a caretaker in March and April 1986. Chelsea's 3-0 win at Huddersfield was their biggest victory in their first league game under a new boss since 2008, when Luiz Felipe Scolari oversaw a 4-0 win against Portsmouth. The Gunners could fail to score in their opening two Premier League fixtures for the first time since 2012, when they began with goalless draws against Sunderland and Stoke. Alvaro Morata has scored only one goal in 15 Premier League appearances since Boxing Day. The Gunners have lost seven of their last eight away league games, with their only win coming at Huddersfield on the final day of last season. Olivier Giroud could become only the second player to score Premier League goals for both sides in this fixture, after Cesc Fabregas. Arsenal lost 11 top-flight away matches last season, equalling their highest tally in the Premier League (set in 1994-95, in a 42-game campaign). Maitland-Niles, Koscielny and Kolasinac are out. Cech; Bellerin, Sokratis, Mustafi, Monreal; Xhaka, Torreira; Mkhitaryan, Ramsey, Özil; Aubameyang. Arsenal to win 2-1 with Aubameyang, Ozil and Hazard the scorers.